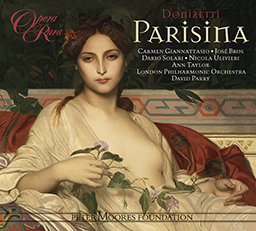 Opera Rara presents a complete recording of the delectable comic opera in 3 acts, Vert-Vert, which was the follow-up to Robinson Crusoe at the Opéra Comique and one of five stage works Offenbach produced in 1869 alone. 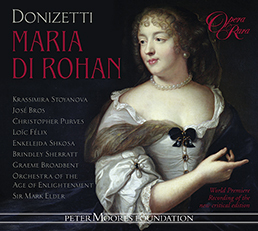 Opera Rara’s association with Offenbach’s music goes back to the company’s revival of his 1867 opéra-comique, Robinson Crusoe (ORC7), and the creation of a new piece, Christopher Columbus (ORC2), with a libretto by Don White, drawing on a host of the composer’s scores. In 2007, Opera Rara resumed its exploration of the huge output of the ‘Mozart of the Champs-Élysées’ with Entre Nous: Celebrating Offenbach (ORR243), a collection of excerpts from more than 20 of the composer’s lesser-known scores. 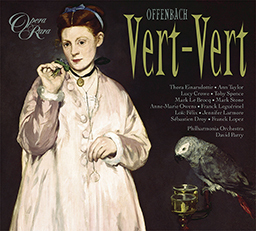 Now Opera Rara presents a complete recording of the delectable comic opera in 3 acts, Vert-Vert, which was the follow-up to Robinson Crusoe at the Opéra Comique and one of five stage works Offenbach produced in 1869 alone. Toby Spence, who starred in ENO’s scintillating La Belle Hélène, takes the role of the charming young man nicknamed Vert-Vert after the deceased favourite parrot of the pupils at a girls’ boarding-school and Jennifer Larmore is cast as the exotic singer, La Corilla. With a libretto by Henri Meilhac and Charles Nuitter, this witty, sophisticated and subtle work is sure to enchant all Offenbach fans. 04 Vert-Vert: Act I: Dialogue: Allons! C’est fini! 10 Vert-Vert: Act I: Dialogue: V’la quelque’un! Sauvez-vous! 14 Vert-Vert: Act I: Dialogue: Mon chapeau? Ou est mon chapeau? 17 Vert-Vert: Act I: Etes-vous prêt? 28 Vert-Vert: Act II: Duet: Ah l’homme charmant! 29 Vert-Vert: Act II: Dialogue: Oh! Ah! 31 Vert-Vert: Act II: Dialogue: Ah! mon maître! 32 Vert-Vert: Act II: Chorus: Chers amis, que voulez-vous? 38 Vert-Vert: Act III: Mimi! Mimi! Mimi! 40 Vert-Vert: Act III: Dialogue: Ouvrez! ouvrez! 42 Vert-Vert: Act III: Dialogue: Rentrez! mesdemoiselles! 47 Vert-Vert: Act III: Finale: Allons, madame Baladon! There is consternation and distress among the boarding girls at the Convent of Saint-Rémy: their beloved pet parrot, Vert-Vert, has died. The girls lament his loss while Binet, the manservant, digs a grave for the parrot beneath the trees in the garden. They are waiting for the young Valentin, who lives at the convent, to give the funeral oration: he is late. He arrives, full of apologies: he had to perfect his improvisation. No sooner has he finished the speech than the girls, led by Mimi, and the sisters Emma and Bathilde, decide they simply must find a replacement for the parrot, to kiss and cuddle, as Mimi puts it. She suggests that Valentin would be ideal: secretly, she is in love with him. The girls enthusiastically beg Valentin to agree. He is persuaded and assumes the parrot’s name, Vert-Vert. The girls lead him away in triumph; Binet is left alone by the parrot’s grave to bemoan their fickleness. He is interrupted by a pair of dragoons jumping over the convent wall. They “dissuade” him from calling for help and introduce themselves as Le Comte d’Arlange and Friquet. It emerges that Le Comte is married to Bathilde. He demands to see her. Threatening to cut off his ears if he refuses, they send Binet to find her. Le Comte reminds Friquet that he and his fellow-officer, Bergerac, who is married to Emma, were forcibly separated from their wives immediately after the marriage ceremony. Binet brings Bathilde and Friquet is sent away; but Binet refuses to leave the lovers alone: they must content themselves with a ménage à trois. The doorbell rings. Le Comte jumps back over the wall, promising to return to rescue the two girls from their prison. Bathilde goes back indoors; Binet is left by the parrot’s grave. The schoolmistress Mademoiselle Paturelle comes into the garden. She is irritated to find Binet and tells him to go into dinner. He leaves in high dudgeon; she waits in high anxiety. The maid announces Baladon, the dancing-master. As soon as they are à deux, it emerges that they have been secretly married. The secret must be kept to prevent Mademoiselle Paturelle from losing her post. Baladon is understandably frustrated by the lack of intimate access to his wife. She has a plan: she gives him a key to the garden gate. He cajoles her into agreeing to an assignation that very night. Their tryst is interrupted by Mimi, Emma and Bathilde, who giggle to see Baladon with his arm around the headmistress. Haughtily, she leads him indoors. Bathilde tells Emma that their husbands have a plan to rescue them. Mimi is equally excited by the idea of escape until she remembers that her beloved, Vert-Vert, lives in the convent too. The other girls laugh at Mimi’s infatuation with a mere child. They leave her to muse: Vert-Vert is definitely no longer a child, she decides. She is interrupted by Binet in a fluster. He tells her that Vert-Vert has been called away to visit his aunt; that he has been chosen to look after Vert-Vert on the journey; and that he is on his way to reserve places on the barge. Mimi is devastated by the news. The entire convent gathers to bid farewell to Vert-Vert. Binet swears to look after him and Vert-Vert swears to be well-behaved. As they leave to take their places on the barge, Mimi, unseen by the others, follows them: she must watch over Vert-Vert as he enters the wide world. At the Lion d’Or in the garrison town of Nevers, the dragoons, including Le Comte and Bergerac, are in buoyant mood. La Corilla, the famous singer and forces sweetheart, is about to arrive for her performance the next day. When she enters the room, Le Comte and Bergerac flirt with her blatantly: they are separated from their wives, after all. To everyone’s delight, she responds in kind with a free performance. The dragoons leave Le Comte and Bergerac alone with La Corilla. They are interrupted by the theatre-director, who is intent on a rehearsal. La Corilla grandly points out that the tenor, Bellecour, is late. At which point the doorbell and a fit of coughing herald his arrival: he has a cold. On the barge, he was involved in a dispute with an idiot manservant who praised his master’s singing above the great tenor’s. The great tenor was thrown into the Loire for his pains. As the theatre director vents his anger over the absent idiot manservant, the latter presents himself in person: it is Binet and the master is Vert-Vert. Binet will not back down and persuades his timid master to sing for the company. They are enchanted. The theatre manager returns from calculating his losses: they must be paid or Binet will be arraigned before a judge. They have no money; so a defiant Binet goes to find the judge with the director and Bellecour, and the two officers as witnesses… leaving Vert-Vert alone with La Corilla. Who sets about seducing him. Particularly, seducing him into singing the performance the next day in place of Bellecour. At first he refuses. But he admits that he became obsessed by a mysterious beauty on the barge; and that that beauty strongly resembled La Corilla. As he falls under La Corilla’s spell, Le Comte and Bergerac return to pursue their flirtation only to see her whisk Vert-Vert away to rehearsal. It serves them right for their inconstancy, they admit. At that moment, an unknown young dragoon appears. A female dragoon. In fact Mimi, who has disguised herself in Friquet’s uniform in order to follow Vert-Vert. Le Comte hatches an immediate plot. Mimi will tell them how to smuggle themselves into the convent to rescue their wives and they will deliver Vert-Vert to her. Binet enters in great distress: he has overheard his master and the others actors shouting their heads off: clearly a very vigorous rehearsal. Le Comte, in furtherance of his plot, tells Binet to invite the actors – and actresses – to join the dragoons at the inn for a party. He rushes off and Mimi is told in no uncertain terms that she will be locked up until they return to Saint-Rémy. The guests arrive, Vert-Vert on La Corilla’s arm. He is flushed with success and soon with drink. The evening ends in riotous celebration. Meanwhile, back at the convent, the girls drearily practice their dancing. They bemoan the lack of male partners. To liven them up, Baladon gives a lecture-demonstration on his obsession: the history of dance. Mademoiselle Paturelle bustles in, full of concern. She has been told that Mimi had been taken to the infirmary and she sends one of the girls to find out how she is. Consternation: Mimi, of course, is not in the convent at all. The messenger returns: Mimi is nowhere to be seen. The girls agree to shout out for her: Mimi, Mimi, Mimi!!! At this moment, to their great relief, Mimi appears. She claims that she has been at the bottom of the garden listening to village gossip and she scandalises Mademoiselle Paturelle by repeating it. There is a fierce ringing at the door. It is Binet with Vert-Vert, apparently in great distress. Amid the confusion, Mimi whispers to Emma and Bathilde that their husbands will meet them later in the garden. At first Vert-Vert and Binet claim that they were held by thieves in a cave. But, after letting slip a swearword, Vert-Vert admits that there is no truth at all in what they said: he has been learning to drink, swear and seduce women. At which he proceeds to try out his new-found swearing and seducing skills, to Mademoiselle Paturelle’s horror and the girls’ delight. Mademoiselle finally manages to shepherd her flock away and leads Binet to the headmistress to learn his fate. Vert-Vert and Mimi are left alone. She begins to reproach him. He stops her: La Corilla taught him the meaning of love; and now he knows that he only loves her, Mimi. They embrace tenderly. Die Pensionatsschülerinnen im Kloster von Saint-Rémy sind zutiefst betrübt: ihr geliebter Papagei Vert-Vert ist gestorben. Während Binet, der Hausbedienstete, dem Papagei im Garten unter den Bäumen ein Grab aushebt, beweinen sie sein Dahinscheiden. Der junge Valentin, der im Kloster lebt, eilt herbei, um die Trauerrede zu halten. Kaum ist sie beendet, befinden die Mädchen, angeführt von Mimi und den Schwestern Emma und Bathilde, dass sie einen Ersatz für den Papagei brauchen, etwas zum Küssen und Kuscheln, wie Mimi sagt. Für diese Rolle schlägt sie Valentin vor, denn insgeheim ist sie in ihn verliebt. Die Mädchen bedrängen Valentin, in den Vorschlag einzuwilligen, und er lässt sich überreden und nimmt den Namen des Papageis, Vert-Vert, an. Im Triumph führen die Mädchen ihn davon, während Binet allein am Vogelgrab zurückbleibt und ihre Wankelmütigkeit beklagt. Er wird aus seinen Gedanken gerissen, als zwei Dragoner über die Klostermauer springen. Sie „überzeugen“ ihn, nicht um Hilfe zu rufen, und stellen sich vor als Le Comte d’Arlange und Friquet. Le Comte offenbart, dass er mit Bathilde verheiratet ist, und beauftragt Binet unter Androhung, ihm sonst die Ohren abzuschneiden, seine Gemahlin zu holen. Le Comte erinnert Friquet daran, dass er und sein Mit-Offizier Bergerac, der mit Emma verheiratet ist, gleich nach der Trauung gewaltsam von ihren Bräuten getrennt wurden. Binet kehrt mit Bathilde zurück, Friquet wird fortgeschickt, doch Binet weigert sich, das Paar allein zu lassen, und zwingt sie, sich in Dreisamkeit zu üben. Die Hausglocke läutet. Le Comte spring über die Mauer in Sicherheit, verspricht jedoch wiederzukommen und die beiden Mädchen zu holen. Bathilde geht ins Haus, Binet bleibt wieder am Grab des Papageis zurück. Die Erzieherin Mademoiselle Paturelle kommt in den Garten, sieht zu ihrer Verärgerung Binet dort stehen und schickt ihn zum Essen ins Haus. Aufgebracht geht er von dannen, während sie nervös wartet. Da meldet das Hausmädchen die Ankunft Baladons, des Tanzlehrers. Sobald die beiden allein sind, stellt sich heraus, dass sie heimlich verheiratet sind. Diese Tatsache darf auf keinen Fall ans Licht kommen, da Mademoiselle Paturelle sonst ihre Anstellung verlieren würde. Baladon ist verständlicherweise empört, dass er seine Gemahlin so selten unter vier Augen sieht, und um ihn zu beschwichtigen, gibt sie ihm den Schlüssel zum Gartentor. Daraufhin überredet er sie, in ein Treffen gleich in der kommenden Nacht einzuwilligen. Ihr Tête-à-tête wird von Mimi, Emma und Bathilde gestört, die kichernd sehen, dass Baladon seinen Arm um die Erzieherin gelegt hat. Nonchalant führt Mademoiselle den Tanzlehrer ins Haus. Bathilde erzählt Emma von ihrer bevorstehenden Rettung. Auch Mimi beflügelt die Vorstellung einer Flucht, bis ihr einfällt, dass ihr geliebter Vert-Vert im Kloster lebt. Die anderen Mädchen verlachen Mimi, in ein bloßes Kind verliebt zu sein, und lassen sie in Gedanken zurück: Vert-Vert, so sinniert sie, sei doch mitnichten ein Kind mehr. Ein aufgeregter Binet unterbricht ihre Überlegungen mit der Nachricht, dass Vert-Vert zu einem Besuch zu seiner Tante gerufen werde, dass ihm, Binet, die Aufgabe übertragen sei, Vert-Vert auf dieser Reise zu begleiten, und dass er sich aufmache, um Plätze auf dem Boot zu reservieren. Ob dieser Nachricht ist Mimi am Boden zerstört. Alle Klosterbewohnerinnen versammeln sich, um Vert-Vert Lebewohl zu sagen. Binet schwört, gut auf ihn aufzupassen, und Vert-Vert schwört, sich gut zu benehmen. Als die beiden schließlich aufbrechen, folgt Mimi ihnen ungesehen: Sie muss Vert-Vert bei seinem Einzug in die große Welt im Auge behalten. Im Lion d’Or in der Garnisonsstadt Nevers sind die Dragoner, darunter auch Le Comte und Bergerac, in ausgelassener Stimmung. Die berühmte Sängerin La Corilla, der Schwarm aller Soldaten, soll am kommenden Tag auftreten. In prachtvoller Aufmachung trifft sie ein. Die beiden Offiziere schäkern unverhohlen mit ihr, schließlich sind sie ja von ihren Frauen getrennt. Zum allgemeinen Entzücken verspricht die Sängerin daraufhin eine kostenlose Darbietung. Die Dragoner ziehen sich zurück, um die Sängerin der Gesellschaft der beiden Offiziere zu überlassen. Da wird das Trio vom Theaterdirektor unterbrochen, der auf einer Probe besteht. Herablassend weist La Corilla darauf hin, dass der Tenor Bellecour noch nicht eingetroffen sei. Im selben Moment künden die Türglocke und ein Hustenanfall von dessen Ankunft: der Sänger ist erkältet. Auf dem Schiff sei er in eine Auseinandersetzung mit einem schwachsinnigen Faktotum geraten, das den Gesang seines Herren höher pries als den des renommierten Tenors, der für seine Mühen in die Fluten der Loire geworfen worden sei. Während der Direktor seinem Zorn über das abwesende schwachsinnige Faktotum Luft macht, stellt eben dieses sich ein: niemand anderer als Binet mit seinem Herrn Vert-Vert im Gefolge. Binet weigert sich, seine Behauptung zurückzunehmen, und überredet seinen schüchternen Herrn, den Versammelten eine Kostprobe seiner Gesangskunst zu geben. Sie sind hingerissen. Der Direktor kehrt zurück, er hat seinen Verlust kalkuliert: ohne Entschädigung werde er Binet dem Richter vorführen. Vert-Vert hat kein Geld, also marschiert ein trotziger Binet mit dem Direktor und Bellecour und den Offizieren als Zeugen davon … und lässt Vert-Vert allein mit La Corilla zurück. Ohne große Umschweife beginnt diese, den jungen Mann zu verführen, insbesondere dazu, an Bellecours Statt mit ihr aufzutreten. Zunächst weigert er sich, doch dann gesteht er, auf dem Boot einer geheimnisvollen Schönheit verfallen zu sein – einer Schönheit, die frappante Ähnlichkeit mit La Corilla habe. Während er dem Bann der Sängerin erliegt, kehren die beiden Offiziere zurück, um ihre unterbrochene Schäkerei wieder aufzunehmen – nur um erleben zu müssen, dass die Dame mit Vert-Vert zu Proben enteilt. Doch wie sie einräumen, geschehe ihnen das angesichts ihrer Treulosigkeit nur Recht. In dem Moment erscheint ein unbekannter junger Dragoner. Vielmehr eine Dragonerin, nämlich Mimi, die Friquets Uniform angelegt hat, um Vert-Vert zu folgen. Sofort schmiedet Le Comte einen Plan: Mimi soll ihnen verraten, wie er und Bergerac sich ins Kloster schmuggeln können, um ihre Gemahlinnen zu erlösen, und im Gegenzug dafür überlassen sie ihr Vert-Vert. Da tritt ein zutiefst bekümmerter Binet hinzu. Zufällig habe er gehört, wie sein Herr und die Schauspieler sich anschrieen, es handele sich wohl um eine sehr hitzige Probe. Le Comte beauftragt Binet, sie alle zu einer Feier mit den Dragonern ins Gasthaus einzuladen. Mimi, so teilen sie ihr mit, werde bis zu ihrer Rückkehr nach Saint-Rémy eingesperrt werden. Die Gäste treffen ein, Vert-Vert am Arm La Corillas. Der Erfolg steigt ihm zu Kopf, und sehr bald auch der Alkohol. Der Abend endet in einer wüst ausgelassenen Feier. Im Kloster üben die Mädchen unterdessen missmutig einen Tanz. Um sie aufzumuntern, gibt Baladon ihnen einen von einer Vorführung begleiteten Vortrag über sein Steckenpferd: die Geschichte des Tanzes. Mademoiselle Paturelle rauscht herein. Sie haben erfahren, dass Mimi ins Krankenzimmer gebracht worden sei, und schickt eines der Mädchen, um nähere Auskünfte einzuholen. Bestürzung und Rätselraten bei den Mädchen. Die Botin kehrt zurück: von Mimi sei nirgends eine Spur zu sehen. Die Mädchen rufen nach ihr: Mimi, Mimi, Mimi!!! Da erscheint Mimi tatsächlich. Sie behauptet, unten im Garten gesessen und dem Dorfklatsch gelauscht zu haben – den sie zu Mademoiselles Bestürzung stante pede wiederholt. Da erklingt wildes Läuten an der Tür: Binet und Vert-Vert, beide offenbar zutiefst bekümmert. Die Verwirrung nutzend, flüstert Mimi den Schwestern Emma und Bathilde zu, dass ihre Gatten sie später im Garten treffen werden. Zuerst behaupten Vert-Vert und Binet, sie seien von Räubern in einer Höhle gefangen gesetzt worden, doch nachdem Vert-Vert ein Fluch über die Lippen gekommen ist, gesteht er, die reine Unwahrheit gesprochen zu haben: vielmehr habe er gelernt zu trinken, zu fluchen und Frauen zu verführen. Zum Entsetzen Mademoiselle Paturelles und zur Freude der Mädchen besteht er darauf, seine neu erworbenen Fähigkeiten im Fluchen und Verführen unter Beweis zu stellen. Schließlich gelingt es der Erzieherin, ihre Zöglinge in Sicherheit zu bringen und Binet der Direktorin vorzuführen: Ihm wird umgehend die Stelle aufgekündigt. Vert-Vert und Mimi bleiben alleine zurück. Sie will ihm Vorwürfe machen, doch er fällt ihr ins Wort: La Corilla habe ihn die Bedeutung von Liebe gelehrt, und nun wisse er, dass er allein sie, Mimi, liebe. Sie sinken sich in die Arme. Le studentesse del convento di Saint-Rémy sono affrante: è morto il loro amato pappagallino, Vert-Vert. Le fanciulle piangono mentre Binet, il servitore, gli scava la fossa sotto gli alberi del giardino. Arriva il giovane Valentin, che abita nel convento, per pronunciare l’orazione funebre. Quando ha finito le fanciulle, capeggiate da Mimi e dalle sorelle Emma e Bathilde, decidono che è assolutamente necessario trovare un sostituto del pappagallino da coccolare e vezzeggiare. Così sostiene Mimi e suggerisce che Valentin sarebbe ideale: è segretamente innamorata di lui. Le fanciulle supplicano Valentin di accettare. Il giovane si lascia convincere e assume il nome del pappagallo, Vert-Vert. Le ragazze lo portano via in trionfo; Binet rimane solo accanto alla tomba del pappagallo e deplora la loro incostanza. Viene interrotto da due di dragoni che scavalcano il muro del convento. Entrambi lo intimidiscono per evitare che chiami aiuto e si presentano: si tratta del Conte d’Arlange e di Friquet. Il Conte rivela di essere sposato con Bathilde. Minacciando di tagliargli le orecchie se rifiuta, gli ufficiali spediscono Binet a cercarla. Il Conte ricorda a Friquet che lui e il suo compagno ufficiale, Bergerac, sposato con Emma, sono stati separati a forza dalle mogli subito dopo la cerimonia delle nozze. Binet conduce Bathilde e Friquet viene mandato via, ma Binet rifiuta di lasciare da soli gli innamorati: dovranno accettare la presenza di un terzo incomodo. Suona la campana. Il Conte scavalca nuovamente il muro, promettendo di ritornare per salvare le due fanciulle. Bathilde rientra e Binet rimane accanto alla tomba del pappagallo. Nel giardino entra la direttrice della scuola, Mademoiselle Paturelle. Irritata dalla presenza di Binet, gli ordina di andare a cena. L’uomo la lascia in preda all’indignazione; lei attende con grande ansia. La domestica annuncia l’arrivo di Baladon, il maestro di danza. Non appena i due si ritrovano da soli, rivelano di essersi sposati di nascosto. Il segreto deve essere mantenuto per evitare che Mademoiselle Paturelle perda il posto. Baladon è comprensibilmente frustrato per gli scarsi momenti di intimità con la moglie. La donna ha un piano: gli consegna la chiave del cancello del giardino e lui la convince ad accettare un appuntamento quella notte stessa. Il colloquio è interrotto da Mimi, Emma e Bathilde, che sono colte dall’ilarità nel vedere Baladon che cinge Mademoiselle con il braccio. Altezzosamente la donna lo accompagna in casa. Bathilde rivela a Emma il piano di salvataggio. Mimi è altrettanto eccitata dall’idea della fuga, finché non si ricorda che nel convento vive anche il suo amato Vert-Vert. Le altre ragazze ridono dell’infatuazione di Mimi per un ragazzino, ma lei fa notare che Vert-Vert decisamente non è più un ragazzino. La interrompe Binet in stato d’agitazione. Vert-Vert deve partire per andare a fare visita a sua zia; lui dovrà accompagnarlo e proteggerlo durante il viaggio e sta andando a prenotare i posti in barca. Mimì è sconvolta dalla notizia. Tutto il convento si riunisce per salutare Vert-Vert. Binet giura che si prenderà cura di lui e Vert-Vert promette di comportarsi bene. Mentre escono per andare a imbarcasi, Mimi li segue, non vista dagli altri: deve proteggere Vert-Vert che si incammina nel vasto mondo. Al Lion d’Or nella città di Nevers, sede del presidio, i dragoni, tra cui sono il Conte e Bergerac, sono di umore allegro. La Corilla, famosa cantante molto apprezzata dall’intero esercito, si esibisce il giorno dopo. La donna fa un ingresso da diva e i soldati si affollano: la distrazione è gradita quando si è lontani dalle. I due ufficiali flirtano apertamente con lei e fanno a gara per presentarsi. Vengono interrotti dal direttore del teatro che vuole svolgere una prova. La Corilla sottolinea che il tenore, Bellecour, è in ritardo. A questo punto il suono del campanello e un accesso di tosse annunciano l’arrivo del cantante, raffreddato. Sulla barca è rimasto coinvolto in una lite con uno stupido servo che esaltava le qualità canore del proprio padrone, dichiarandolo superiore al grande tenore e alla fine il grande tenore è stato scaraventato nella Loira. Mentre il direttore impreca contro lo stupido servitore assente, fa ingresso proprio quest’ultimo: si tratta di Binet e il suo padrone è Vert-Vert. Binet si ostina a far cantare il timido padrone davanti a tutti, che rimangono incantati. Il direttore ritorna dopo aver calcolato le sue perdite: se non viene rimborsato, Binet sarà convocato davanti a un giudice. Vert-Vert non ha denaro, per cui l’insolente Binet accompagna il direttore e Bellecour e gli ufficiali li seguono per fare da testimoni… lasciando Vert-Vert da solo con La Corilla, che inizia subito a cercare di sedurlo. In particolare, cerca di convincerlo a esibirsi nello spettacolo al posto di Bellecour. Inizialmente il giovane si rifiuta, ma ammette che sulla barca lo aveva affascinato una donna bella e misteriosa, che somigliava molto alla Corilla. Mentre la Corilla continua nella sua opera di seduzione, rientrano i due ufficiali per continuare a corteggiarla, ma lei trascina via Vert-Vert per una prova. I due ammettono di essere stati giustamente puniti per la loro incostanza. In quel momento entra un giovane dragone sconosciuto. Si tratta in realtà di Mimi, che si è travestita con l’uniforme di Friquet per seguire Vert-Vert. Il Conte immediatamente studia un piano: Mimi deve rivelare come fare a entrare di nascosto nel convento per salvare le mogli e loro le consegneranno Vert-Vert. Entra Binet, sconfortato. Ha sentito il padrone e gli attori urlare: chiaramente una prova molto vigorosa. Il Conte spedisce Binet perché inviti tutti alla locanda con i dragoni per una festa. Nel frattempo a Mimi viene comunicato senza tante cerimonie che rimarrà chiusa a chiave fino alla partenza per il convento. Arrivano gli ospiti, Vert-Vert a braccetto di La Corilla. È inebriato dal successo e ben presto dall’alcool. La serata si conclude con rumorosi festeggiamenti. Intanto, al convento, le ragazze si esercitano malinconicamente a ballare. Per rallegrarle, Baladon fa una lezione sulla sua ossessione: la storia della danza. Entra Mademoiselle Paturelle. Le hanno detto che Mimi è stata portata all’infermeria e invia una delle ragazze a chiedere sue notizie. La messaggera ritorna: Mimi non si trova. Le ragazze provano a chiamarla ad alta voce. La fanciulla entra in quel momento e dice di essere rimasta in fondo al giardino ad ascoltare i pettegolezzi del villaggio; li ripete, scandalizzando Mademoiselle. Dopo una forte scampanellata, entrano Binet con Vert-Vert, apparentemente disperati. Nella confusione, Mimi rivela sotto voce a Emma e Bathilde che i loro mariti le aspettano più tardi nel giardino. Inizialmente Vert-Vert e Binet sostengono di essere stati prigionieri di alcuni ladri in una grotta. Ma, dopo essersi lasciato sfuggire un’imprecazione, Vert-Vert ammette che non è vero: ha imparato a bere, imprecare e sedurre le donne. A questo punto passa a dimostrare le sue nuove conoscenze e inizia a imprecare, tra l’orrore di Mademoiselle Paturelle e il divertimento delle ragazze. Mademoiselle infine riesce ad allontanare le educande e porta Binet dalla direttrice per farlo licenziare. Vert-Vert e Mimi rimangono da soli. Lei comincia a rimproverarlo, ma lui la interrompe: La Corilla gli ha insegnato il significato dell’amore e adesso lui sa di amare solo lei, Mimi. Entrambi si abbracciano teneramente. Le pensionnat de Saint-Rémy est dans le plus grand émoi : Vert-Vert, le perroquet adoré des jeunes filles est mort. Elles lamentent sa perte tandis que Binet, le jardinier, creuse une tombe pour lui sous les arbres. Le jeune Valentin, qui vit au pensionnat, vient prononcer l’oraison funèbre de Vert-Vert. À peine a-t-il terminé que les pensionnaires – Mimi et ses sœurs Emma et Bathilde en tête – décident qu’il leur faut absolument trouver « quelqu’un à câliner, à dorloter », dit Mimi, pour remplacer le perroquet défunt. Valentin serait idéal d’après elle, qui est secrètement amoureuse de lui. Ces demoiselles supplient Valentin d’accepter. Il y consent et se fera appeler Vert-Vert. Elles l’entraînent en triomphe ; Binet, resté seul auprès de la tombe du perroquet, déplore leur frivolité. Il est interrompu par l’apparition de deux dragons qui ont escaladé le mur du pensionnat. Ils le « dissuadent » d’appeler à l’aide et se présentent : comte d’Arlange et Friquet. Le comte révèle qu’il est marié à Bathilde. Après avoir menacé Binet de lui raccourcir les oreilles, les deux hommes l’envoient chercher la jeune femme. Le comte rappelle à Friquet comment lui et son ami Bergerac, le mari d’Emma, ont été séparés de force de leur femme juste après la cérémonie de mariage. Binet revient accompagné de Bathilde, et Friquet est prié de s’éloigner ; mais Binet refuse absolument de laisser les amants seuls : il tiendra la chandelle. On sonne à l’extérieur. Le comte s’échappe en repassant par-dessus le mur, non sans avoir promis de revenir délivrer Bathilde et sa sœur. Bathilde se retire à l’intérieur ; Binet se retrouve à nouveau seul auprès de la tombe du perroquet. La sous-directrice du pensionnat, Mademoiselle Paturelle, entre dans le jardin. Fâchée d’y trouver Binet, elle l’envoie dîner. Il s’éloigne furieux ; elle attend dans la plus grande agitation. La servante annonce l’arrivée de Baladon, le maître de danse. Dès qu’ils sont seuls, on comprend que Baladon et Mademoiselle Paturelle sont mari et femme. S’ils gardent leur union secrète, c’est pour que Mademoiselle Paturelle puisse conserver son poste. Baladon est naturellement frustré par l’absence d’intimité entre eux, mais elle a la solution : elle lui remet une clé qui lui ouvrira le portail du jardin. À force de cajoleries, il la persuade de lui donner rendez-vous le soir même. Leur tête-à-tête est interrompu par l’arrivée de Mimi, Emma et Bathilde, qui pouffent de rire à la vue de Mademoiselle enlacée par Baladon. Ne leur témoignant que dédain, la sous-directrice conduit Baladon à l’intérieur du pensionnat. Bathilde annonce à Emma l’enlèvement prévu. Mimi, pleine d’enthousiasme pour le projet, se rappelle soudain que son Vert-Vert adoré réside au pensionnat. Ses sœurs se moquent d’elle pour être tombée amoureuse d’un enfant. À leur départ, Mimi reste songeuse: Vert-Vert n’est décidément plus un enfant, se dit-elle. Apparaît alors Binet tout agité. Il annonce le départ prochain de Vert-Vert, que sa tante a fait appeler ; c’est lui, Binet, qui lui servira de mentor durant le voyage et il va de ce pas retenir les places de coche. Mimi est bouleversée. Tout le pensionnat est réuni pour faire ses adieux à Vert-Vert. Binet promet de bien s’occuper de lui et Vert-Vert jure d’être sage. Au moment du départ, Mimi se glisse discrètement après eux : elle entend bien suivre Vert-Vert jusque dans le vaste monde pour veiller sur lui. Au Lion d’Or, les dragons en garnison à Nevers sont de la meilleure humeur. Parmi eux : le Comte et Bergerac. La Corilla, célèbre chanteuse adulée par la troupe, doit se produire le jour suivant. Elle arrive dans toute sa splendeur. Les deux officiers flirtent honteusement avec elle – ils sont, après tout, sans leur femme. Pour le plus grand plaisir de tous, la Corilla leur fait l’honneur d’une chanson. Les dragons se retirent, laissant la chanteuse seule avec les deux officiers. Arrive alors le directeur du théâtre, venu organiser une répétition. Majestueuse, la Corilla lui fait remarquer que le ténor, Bellecour, a du retard. À ce moment précis, on entend sonner à la porte et tousser : le chanteur est enrhumé. À bord du coche, il s’est querellé avec un idiot de valet qui prétendait que la voix de son maître était bien plus belle que la sienne. Le grand ténor a fini par se faire jeter dans la Loire. Alors même que le directeur du théâtre s’emporte contre le valet en question, celui-ci apparaît : c’est Binet accompagné de son maître Vert-Vert. Binet ne retire rien de ce qu’il a dit et, vainquant la timidité de son maître, le persuade de chanter. Tout le monde s’en réjouit. Le directeur entreprend le décompte de ses pertes : si on ne peut pas le rembourser, Binet sera traduit en justice. Vert-Vert n’a pas le sou ; aussi Binet, impénitent, est-il obligé de suivre le directeur et Bellecour, accompagnés des officiers qui leur serviront de témoins… laissant Vert-Vert seul avec la Corilla. Celle-ci entreprend de le séduire. Et de le séduire pour qu’il accepte de chanter le lendemain à la place de Bellecour. Il commence par refuser. Mais il avoue bien vite être obsédé par le souvenir d’une mystérieuse beauté aperçue à bord du bateau ; celle-ci ressemblait beaucoup à la Corilla. Il tombe sous le charme de la Corilla qui l’entraîne à la répétition, à la surprise des deux officiers venus reprendre leur badinage amoureux. Bien fait, cela nous apprendra à être inconstants, en concluent-ils. Apparaît à ce moment-là un jeune dragon inconnu. Un dragon femme, en fait : c’est Mimi qui a volé à Friquet son uniforme pour mieux suivre Vert-Vert. Le comte pense immédiatement à un subterfuge : Mimi leur dira comment s’introduire discrètement dans le pensionnat pour enlever leur femme et, en retour, ils lui livreront Vert-Vert. Binet les rejoint, très agité. Il a entendu son maître et les acteurs crier très fort – manifestement en pleine répétition. Le comte envoie Binet inviter toute la troupe à rejoindre les dragons à l’auberge pour une fête. Quant à Mimi, elle restera impérativement enfermée dans sa chambre jusqu’à leur retour à Saint-Rémy. Les invités arrivent, Vert-Vert au bras de la Corilla. Le succès – et bientôt le vin – lui monte à la tête. La fête bat son plein jusque dans la nuit. Cependant, à Saint Rémy, les pensionnaires font de la danse avec peu d’enthousiasme. Pour les réveiller, Baladon se lance dans une leçon-démonstration sur son thème préféré : l’histoire de la danse. Mademoiselle Paturelle entre précipitamment. Elle a appris que Mimi avait été emmenée à l’infirmerie et envoie une des élèves prendre de ses nouvelles. C’est la consternation et la confusion chez les pensionnaires. L’élève revient pour dire que Mimi est introuvable. Ses camarades l’appellent : Mimi, Mimi, Mimi !!! Celle-ci apparaît au moment même en disant qu’elle écoutait au fond du jardin les bavardages des villageois et entreprend de les répéter devant Mademoiselle scandalisée. On sonne violemment à la porte. C’est Binet accompagné d’un Vert-Vert manifestement très perturbé. Dans la confusion qui s’ensuit, Mimi prévient tout bas Emma et Bathilde que leur mari les rejoindra plus tard dans le jardin. Vert-Vert et Binet commencent par dire qu’ils ont été attaqués par des voleurs qui les ont enfermés dans une caverne. Mais après avoir laissé échapper un juron, Vert-Vert finit par avouer qu’il n’y a rien de vrai dans cette histoire : il a appris à boire, à jurer et à parler aux femmes. Sur ce, il s’essaie à une bordée de jurons et à la séduction, au désespoir de Mademoiselle Paturelle et pour le plus grand plaisir des pensionnaires. Mademoiselle parvient enfin à éloigner ses ouailles et conduit Binet chez la directrice pour le faire renvoyer. Vert-Vert et Mimi se retrouvent seuls. Elle commence par lui adresser des reproches, mais il l’interrompt : la Corilla lui a appris ce qu’est l’amour et il sait désormais que c’est Mimi qu’il aime. Les jeunes gens s’étreignent tendrement.